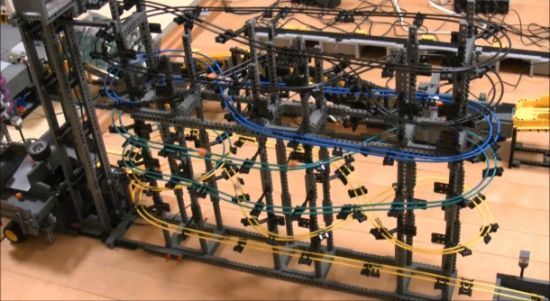 You may have seen some of the most unique LEGO machines in the past, but the “Great Ball Contraption” by the 21 year old Japanese brick artist, nicknamed “akiyuky,” is sure to give food for your thought. Measuring 4.9 x 21.3 feet in dimensions, the artistic device features crisscross stairs, spiral lifts, cranes and a basket shooter to demonstrate its meticulous intricacies. Moving a number of small balls through screws, lifts, elevators and conveyors of the 101.7-foot path, the complex LEGO ball machine mesmerizes viewers with its minute and precise detailing. I’m falling short of words to describe the precision and minuteness of the machines, so it’d be better to have a look at the video (after the jump) to go through the working of LEGO Great Ball Contraption.